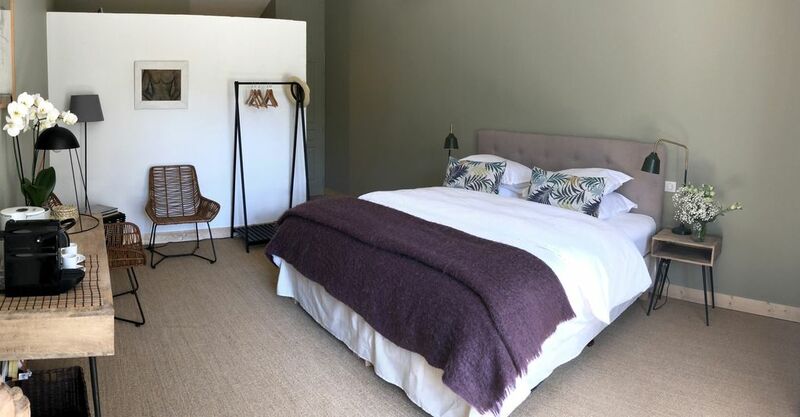 Completed in 2018, in an annex of the house, facing the pool, the pool side suite of 40 m2 is air-conditioned, has a king size bed of 180x200, a real extra bed of 90x200 can accommodate up to for 3 people, a bathroom with walk-in shower and toilet, linens, bath products, dryers, and a private terrace. It is equipped with a Nespresso machine, a boil and a free wifi access. The mas of Caustes, date from the end of the XVIII century, and stayed in the same family until 2013, when we acquired it and completely renovated. It is located in Saint Remy de Provence, in the garden district, so called, because thanks to the wealth of alluvium of the Durance, everything pushed, in contrast with the aridity of the Alpilles. Served on the terrace in the shade of one of the most beautiful wisteria in the region, breakfast is a homage to local production. Traditional jams, traditional Viennese pastries, Alpilles goats, juices and fresh fruits, including figs freshly picked from the hundred-year-old garden, will ensure a gentle awakening. In winter, breakfast is served in the dining room next to the fireplace. On a plot of 6,000 m2, the garden consists of an olive grove, and on the other hand, a landscaped garden, where ancient trees, smells of lavender, thyme and rosemary, the colors of Mediterranean flowers and plants and a rose garden that blooms all year round. Around the salt-filtered pool (without closing), in the hammock in the shade of the big cedar, on the pool bed or sunbathing, in the caravan tribute to the Camargue gypsies, you will discover the sound of cicadas all art of the Provencal nap. In the evening, you can enjoy a glass of rosé des Alpilles, while enjoying the softness of the Provençal evenings.